My Little Bob Dylan - customised MLP! 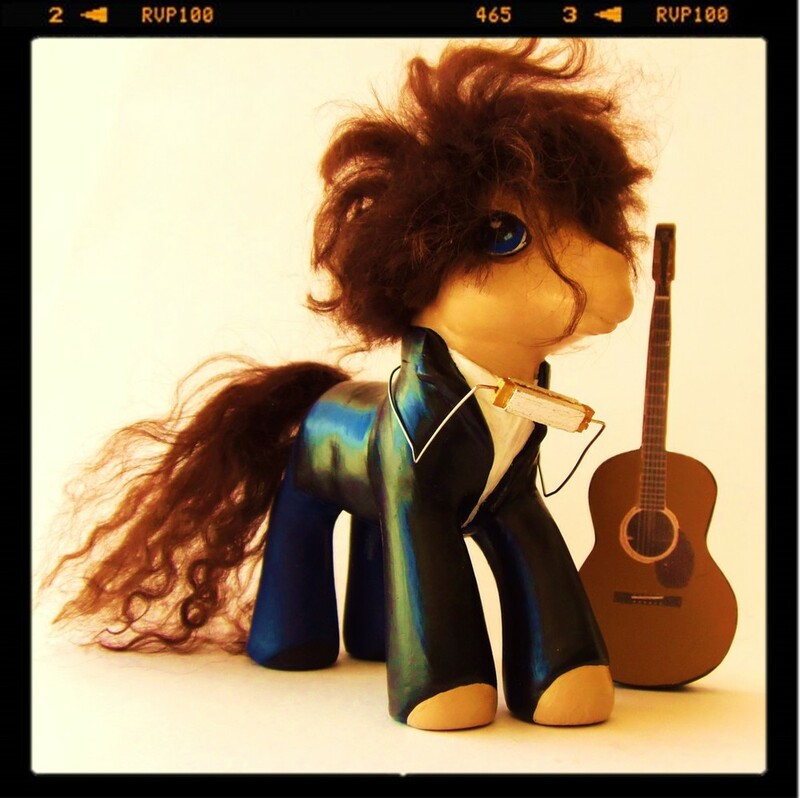 The first pony to be customized in this series of three, is My Little Bob Dylan. * If you haven't caught up with the initial beginnings of this Pony Customization Project, the base modelling, click here. For My Little I. M. Pei pony project, click here. For My Little Artworker Pony Project, click here. Da MAN. Complete with guitar & harmonica. And hair. Now, I'm not the most ardent fan, but as a cultural icon of liberated, political, western youth, Bob Dylan has no equal. Although Billy Bragg also springs to mind. Yes yes, now I can think of a few (Bob Marley, anyone? 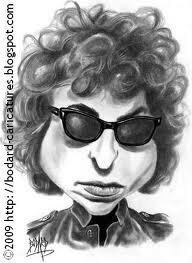 ), but Dylan does stand alone, having chosen a turning point in contemporary Western society - 1960's-1970's - to imprint his Self as one of the foremost pop identities of 'our day' (still playing). And a musical genius/restructure-er to boot. Both fans and detractors alike would probably agree that Bob Dylan is a thoughtful man, a man of many thinkings; the irony in portraying him as a Pony is plain to see. But, y'know, Ponies are all about peace love & friendship too, with all that communal living & conflict resolution stuff going on...and Dylan was a very pretty boy, like all good ponies. 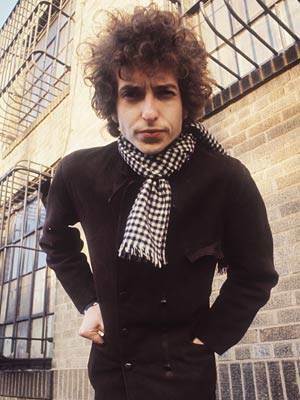 Dylan's sartorial style seems to be largely carried in his hair, face and force of personality; his music and lyrics precede him (only just) but there's a certain intensity, a charisma I needed to capture for this pony to be convincing; it's that rock 'n roll attitude, man. Naturally, the musical instrument accessories help too. I decided that this MLBD would be of the late 60's early 70's era, when the James Dean rebel type image was playing across the world screen. Hence black jacket & jeans. I ran this idea past a life-long fan of the man & his music & I've been assured that my portrayal here is firmly in the 1964/65 Dylan, when he was "still bound to his acoustic sets, all sunglasses and leather, but still had a very feminine side". Yikes. That's good, I replied! 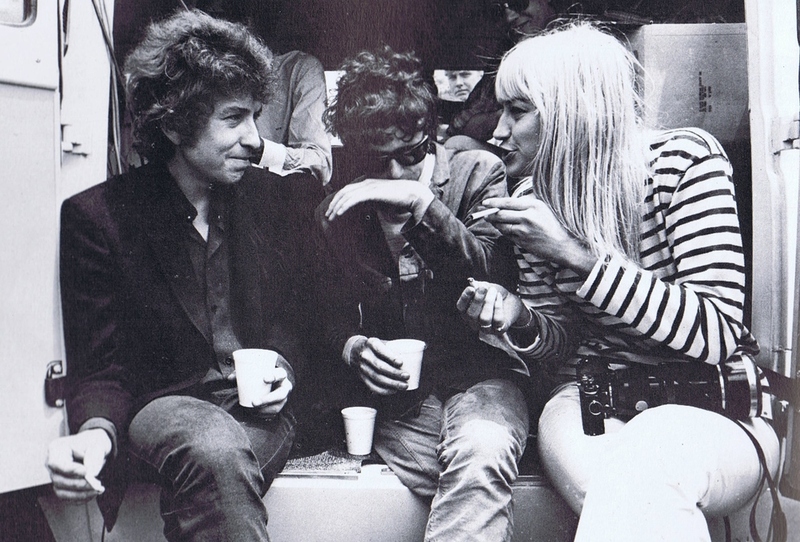 In looking at photos of that era Dylan, that's all he seems to wear anyway. I even found him here, photo left, in this sweetly lovely Dylan doll made by Kay Petal. A lot of it's in the hair of course, but I did put in some time modelling the bait pony's face: the pointy chin, hooded eyes, sensuous mouth (!) and a hint of the jowls that developed with his years. Caricatures are helpful in clarifying these. Note the great looking twang of strings at the end near the pegs, nice! His accessories were fun to make. He required a guitar of course, so I looked online for which one he might've used circa late 60's early 70's. (Sooo much info available out there on Mr Dylan! Even a conspiracy theory about his true eye colour - I went with blue btw.) I was keen on him having a cool hat too, but turned out to be too much mucking around & I chickened out, likewise with sunglasses. Hey, I'm not that keen on teeny dolls. I did a quick cardboard mockup of the sunnies, but as I'd lavished some time on his eyes, it didn't seem like a great idea. His guitar I made as a Martin 1949 00-17 acoustic, as he is said to have used from approx 1959-61. For a wealth of information, Dylan's Guitars is but one of the sites which made reference to this. I am by no means an expert on Bob Dylan! Please, those of you who are, I'm just doing an indication of him here, not a definitive study! In fact, in the end, I deliberately took an image that was an approximation of that particular guitar so as to not get too literal about it. I used Balsa wood to craft the instrument body, acrylic paint to colour and glued on a printout of a guitar on the face, adding paint over this to bring them together more. Painting on all those teeny frets and strings? No thanks, the colour print is ok. Now I'm thinking that had I done the real strings all springing out at the pegs it would really look great, as seen in one of the images in the slides above. But no! Balsa wood to make the harmonica as well, but gilded with metal leaf and with a thin metal holder frame that just poked into the soft wood at the ends. Getting this to hang correctly was tricky and again, all of this could be made a lot better with more time spent. Next time. Acrylic artist's colours, carefully brushed, no big secret. For a perfect finish, spray would've been better. The eyes were not too hard, I'd been careful to leave the originals alone, just painting around them, although the modelling helped with his expression already. As mentioned earlier, I gave this guy blue eyes, an apparently debatable decision. And eyebrows: MLP don't have eyebrows, and although these are fairly well covered by hair, I thought he needed them and the added intensity. As well as a hint of long lashes and soulful bags under his eyes. As Kris Kristofferson is purported to have said, he was "captivating". I explored making a doll wig first, wondering if I could just cunningly cut a piece of hide and glue it on. Nope. 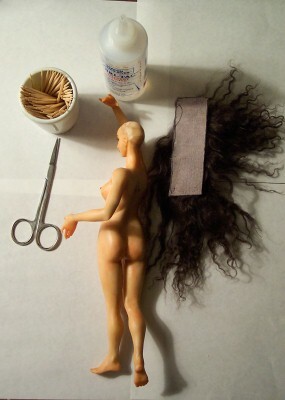 Turns out that Tibetan Lamb hair is the stuff to use for 'artist's dolls' hair, ask the One-Of-A-Kind doll artist's online forums.. You can buy it here at Morezemore Estate and the same nice OOOAK artist put together this tutorial so I'd know what to do with it. I followed it and she's 100% the way to go; it's very clear and detailed with step by step photos as well. All you need! Click on image for Morezemore Estate tutorial. In brief: use a fine tooth comb (I found one from the pharmacy for removing head lice!) to pull all snags from fur, wet the hair to form "locks" then dry. Cut the hair from the skin, right at the roots, like shearing. Then separate the locks into individual strands and glue on all over the head, piece by piece in the order shown on Morezmore's tutorial. *She has a whole page of OOAK tutorials, an index covering everything from armatures to wings, and very kind of all the contributors to provide them too. Even though it was my very first attempt at anything like this...it worked! The nice person even tells you how to style the Tibetan Lamb Fur! For these scruffy curly locks: comb it, wet in with a water mister and let dry, phew, that was easy. No problem, but I knew Dylan's hair would require a concerted effort with the placement of each curly lock. It's a distinctive look and crucial to the success of the toy's 'personification'. This required a lot of concentration, making sure each & every little lock of hair was placed just so, in order to fall the right way. Yes, it matters. However, I'm pleased with this, my first doll's hair, although it must be said that making a messy hairstyle is not the most challenging 'do, it's just lucky for me. BUT, my Dear Public, I broke one of the cardinal rules of doll hair with Mongolian Lamb Fur: I cut his hair to length from the ends of the locks, not the root. AND, I did this after I'd glued it down. Tsk tsk tsk. That's a mistake I won't make again. This is the point when I give a weary "never mind...". It looks sorta OK.
Silly me. The last thing: of course he needs a tail! So, that's how I made my My Little Bob Dylan Pony. It was fun! He even has his The Band! I do hope you've enjoyed this Pony ride.